There are almost 650,000 registered Syrian refugees in Jordan, the majority of whom rely on humanitarian assistance to meet their basic needs. A US ally and one of only two Arab nations to make peace with Israel, the other being Egypt, it is considered one of the safest countries in the region. Civil war in neighbouring Syria has seen Jordan receive around 650,000 Syrian refugees. The resurgence of Islamic militancy in Iraq also presents security issues. Médecins Sans Frontières/Doctors Without Borders (MSF) first began working in Jordan in 2006 in response to the medical needs of Iraqi refugees. The huge growth in the number of refugees in Jordan has placed increased pressure on the country's health system. 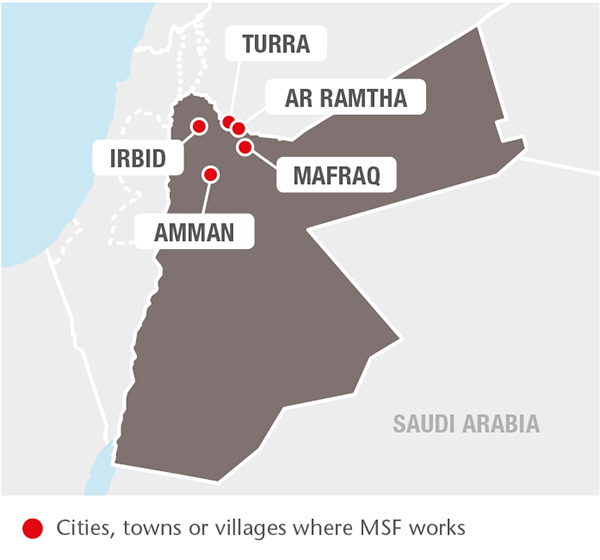 MSF operates three clinics in Irbid governorate dedicated to providing Syrians and vulnerable Jordanians with treatment for non-communicable diseases (NCDs), a leading cause of death in the region. The clinics offer medical care, home visits and psychosocial support to about 5,000 patients with diseases such as diabetes and hypertension. In 2017, the clinics carried out more than 37,000 consultations. MSF also supports a comprehensive primary healthcare centre in Turra, in Sahel Houran district, Ar Ramtha, which serves Syrian refugees and the local community. The team there conducted 12,554 consultations in 2017. MSF is the main provider of reproductive healthcare for Syrian refugees in Irbid governorate, where it runs a 22-bed maternity department and a neonatal intensive care unit. In 2017, the teams assisted 4,120 deliveries, admitted 664 newborn babies and carried out some 16,000 antenatal consultations. MSF has also increased its focus on mental healthcare, offering support to Syrian children and their parents in a project based in Mafraq, as well as through outreach consultations and sessions held at the NCD clinics and primary healthcare centre in Irbid. The various teams provided individual and group counselling, psychosocial support and health education sessions. The Amman reconstructive surgery hospital continues to treat war-wounded patients and indirect victims of violence from neighbouring countries. The hospital provides comprehensive care for patients requiring orthopaedic, reconstructive and maxillofacial surgery, including physiotherapy and mental health support. In 2017, 1,150 surgical procedures were performed, and an average of 188 patients were being treated in the hospital at any one time. Syrian taxi driver injured by a barrel bomb getting treatment in Al-Mowasah Hospital Amman. 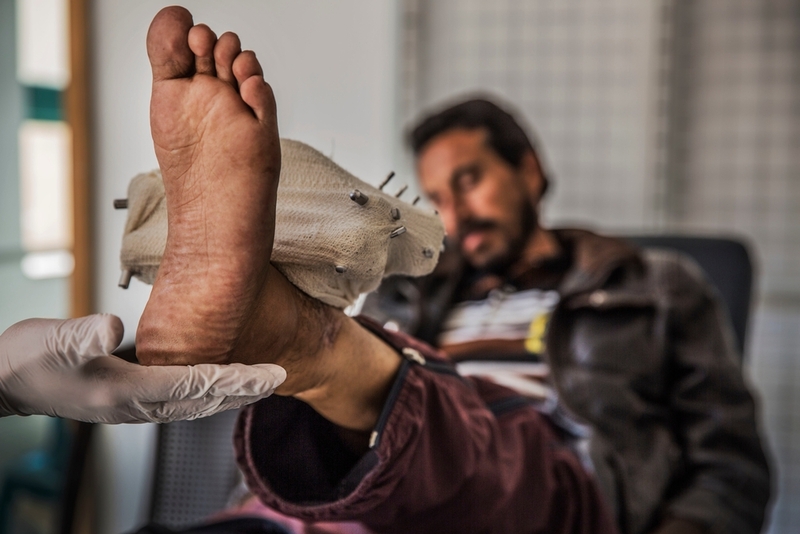 Since 2013, MSF’s emergency surgical project in Ar Ramtha in northern Jordan has been offering emergency surgical and post-operative care to war-wounded patients referred from field hospitals in southern Syria. As fighting escalated in the first half of 2017, MSF saw an increase in the number of severely wounded patients evacuated to the hospital for urgent medical treatment. However, following the creation of a de-escalation zone in southwestern Syria in July, the level of violence decreased and there was a sharp decline in the number of patients arriving at the hospital. MSF has therefore decided to close the Ar Ramtha project by the end of January 2018. In 2017, staff admitted and treated 295 war-wounded patients, conducted over 600 major surgical interventions and carried out more than 1,650 psychosocial support sessions.